While those two recipes have become staples in my kitchen over the past couple of years (especially the Polenta Rounds with Sausage Ragu! 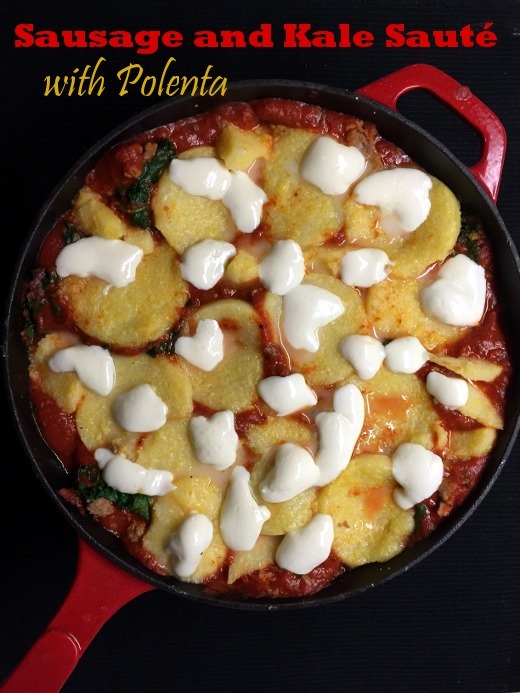 ), I was intrigued by this similar Cooking Light recipe which incorporates the yummy trio of polenta + sausage + tomatoes, with the addition of kale and fresh mozzarella. To prepare, first crumble and cook four ounces of Italian sausage in an oven-proof skillet (mine is a Lodge enameled cast iron skillet; bare cast iron might not be the best choice for this recipe though since it contains acidic tomato sauce) over medium-high heat, then remove the sausage from the pan and set aside. I used sweet Italian turkey sausage in this recipe. 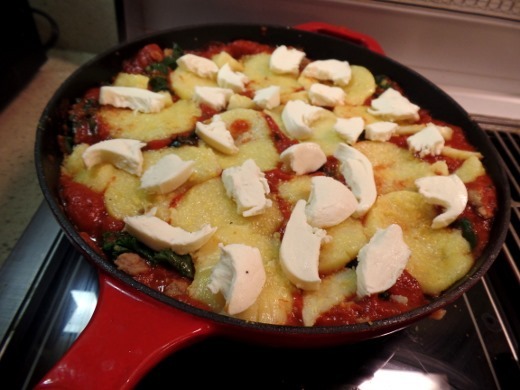 Next add slices of prepared polenta to the skillet and cook for 5 minutes on one side only. Tubes of prepared polenta are easy to find (near the pasta in my grocery store) and relatively inexpensive. 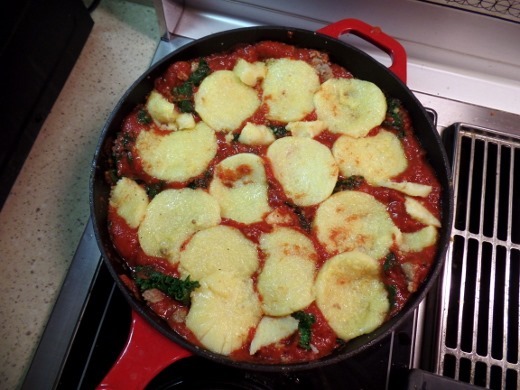 Remove the heated polenta from the pan and next add 6 ounces of chopped kale, a splash of water, and black pepper. Cover and cook until the kale is slightly wilted, about 2 minutes. Now add the cooked sausage back to the skillet. At this point, you’ll want to “nestle” the polenta rounds back into the skillet, cooked side up. And the final ingredient – 2 ounces of fresh mozzarella, torn into small pieces. The final step is to place the (again, oven-proof!) 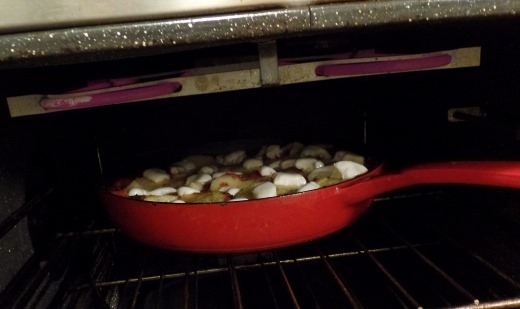 skillet under a preheated broiler for two minutes, until the cheese has melted. I always get a hoot out of uploading pictures of the inside of my oven and seeing that the elements appear PINK for some reason! Scoop and enjoy! 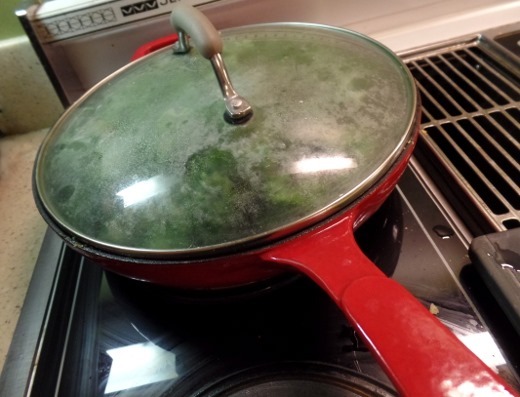 It’s a one-pan complete meal! 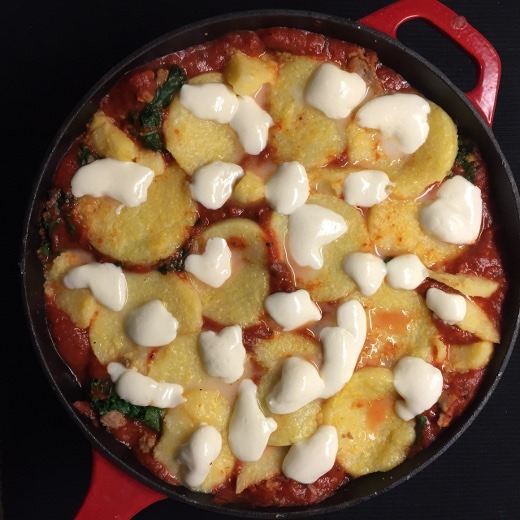 The kale and mozzarella were terrific additions to this easy skillet meal which uses minimal ingredients. I’ll be making it again. 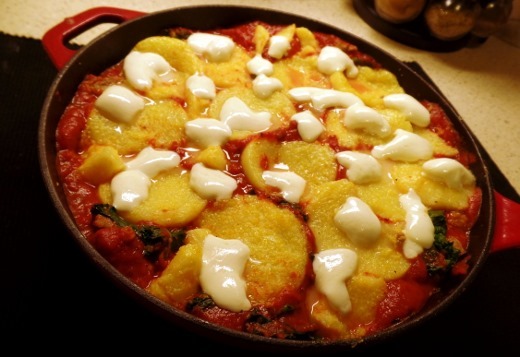 What I’d Change Next Time: I’d use Hot Italian Turkey Sausage for a little more heat! Fresh basil might be nice touch on top as well, if I had it on hand already. I also might broil the dish for an extra minute or two longer in the final step. 1. Preheat broiler to high. 2. Heat olive oil in a skillet over medium-high. Add sausage; cook 3 minutes, stirring. Remove sausage. 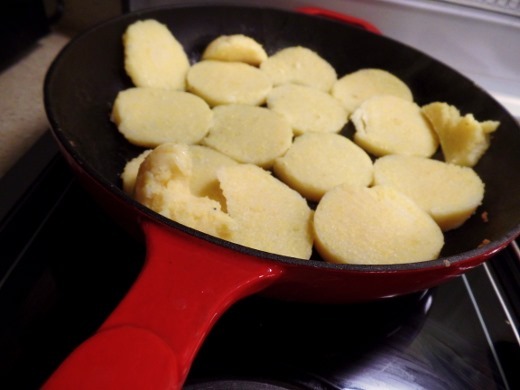 Add polenta to pan; cook 5 minutes. Remove polenta. 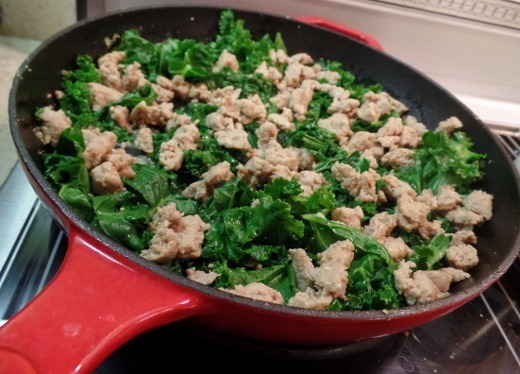 Add kale, 1 tablespoon water, and pepper to pan. Cover; cook 2 minutes. 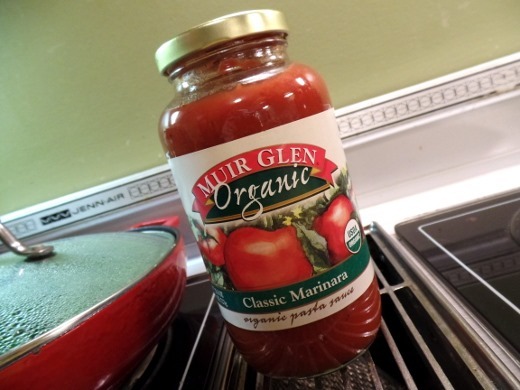 Uncover; stir in sausage and marinara. Nestle polenta, browned side up, into sausage mixture; sprinkle with cheese. Broil 2 minutes.